Alyssa and I attended for the first time the Munich Show, as we have been lucky enough to have found sponsors to fund our trip there. I do not think I am exaggerating when saying that I have been blown away by the show! 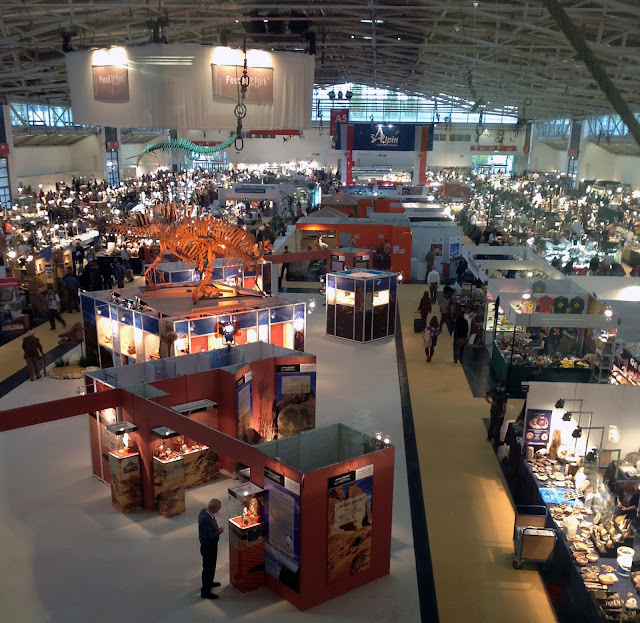 Four huge halls of what used to be an airport were transformed into an impressive market for minerals, fossils and gems! In two of those halls, an impressive temporary exhibit was put into place by the Show organizers and the good will of museums and private collectors. We were proud and happy to have brought 6 minerals to be part of this special "African Secrets" exhibit! 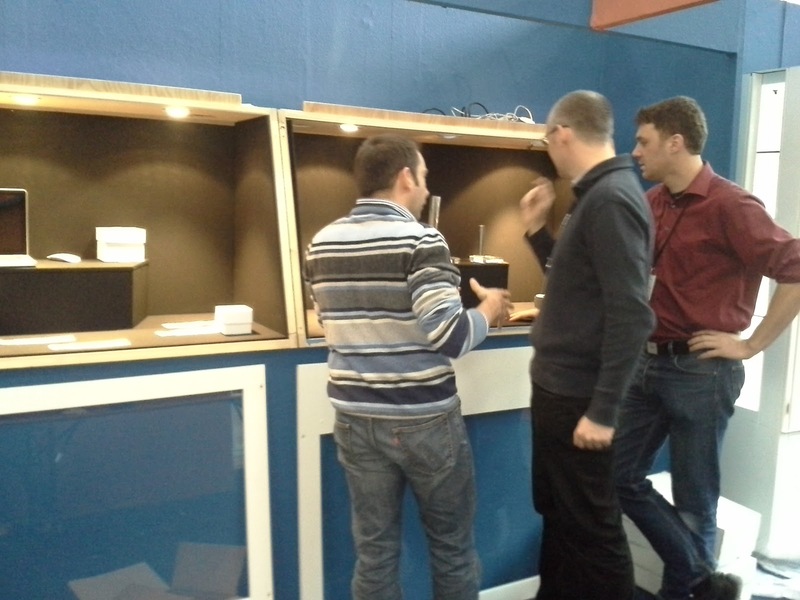 The show opened on Thursday 25, October for the "professional day". As the special exhibit needed to be put together by Wednesday, I flew on Monday 22nd, arriving on the Tuesday at night. As soon as I was done with custom, I took a cab to the Neue Messe München, where the show was held. I had a warm welcome by Christoph Keilmann and his team upon arrival, with a German beer put into my hand not a minute after I arrived! 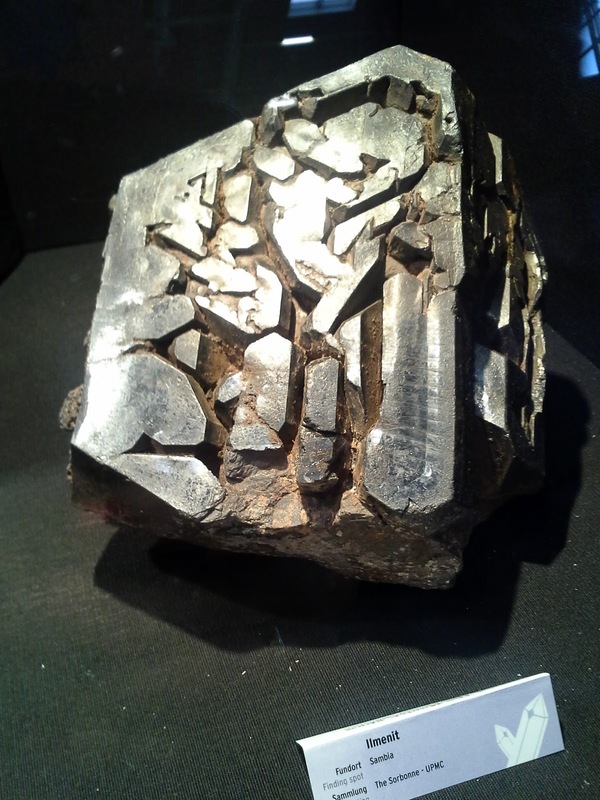 The minerals were safely stored in the vault, and Christoph showed me around. I was impressed that already on the Tuesday, some dealers in Hall A6 were already set up, some with all of their rocks already on display. 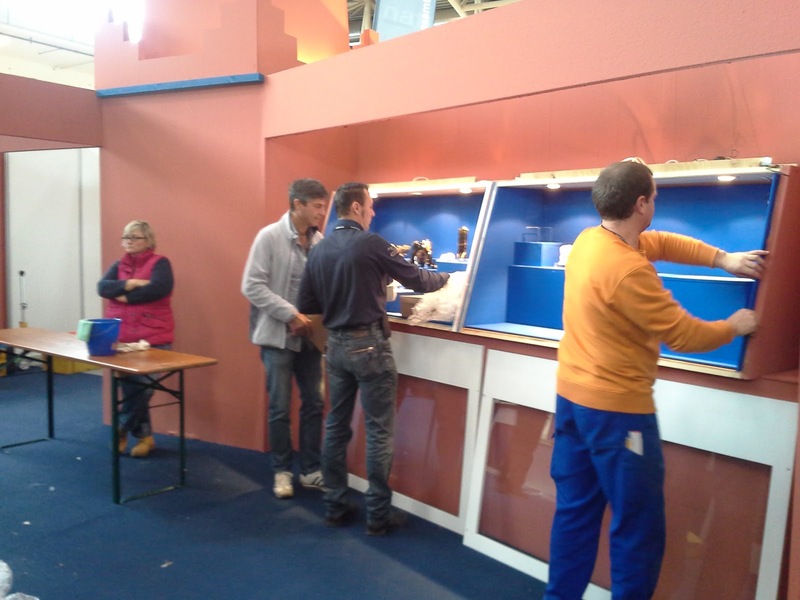 At 8pm, the Spirifer team was still working on their booth! It was soon time for me to head to the hotel, and try to catch up with a missed night of sleep. Ian and Diana discussing the organization. Cutting the pre-labels of 600 specimens. That was fun!!! Done with organizing the labels, time for a break! Now that the "African Secrets" exhibit is built, it's time to put rocks in it! Frederico is getting his Madagascar specimens out. The Moroccan corner getting ready. Set up of the lighting for the liddocoatite from Madagascar. Lois displaying the African gold and emerald. Set up of the lighting for the tanzanite. 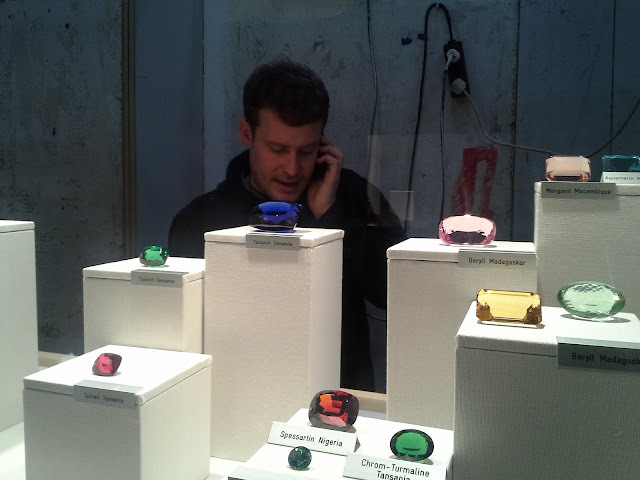 Christophe Keilmann, behind the amazing gems from Africa. 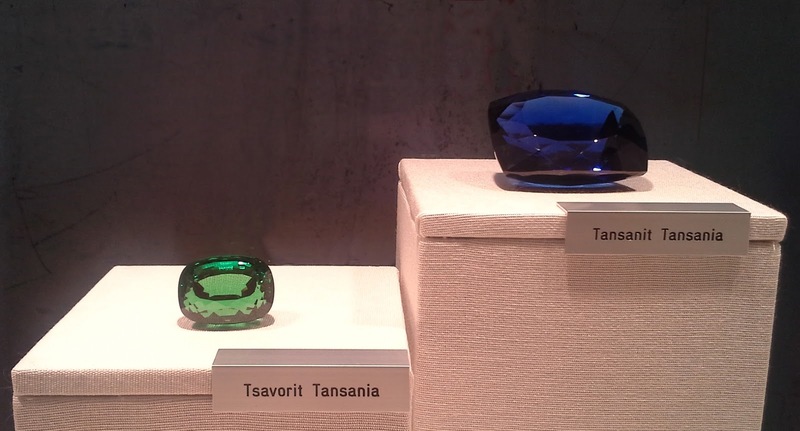 Click to read more about the special tanzanite exhibit, and the rest of the African exhibits! And before the opening, I was able to take a few pictures of the special exhibit. It was really crowded the following days, it was nice to be able to take pictures in such nice and quiet conditions! 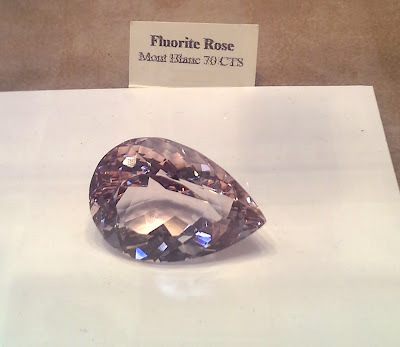 The diamond display, with a rough diamond over 200 ct provided by De Beers, and the rest mostly by the Natural History Museum of Paris. 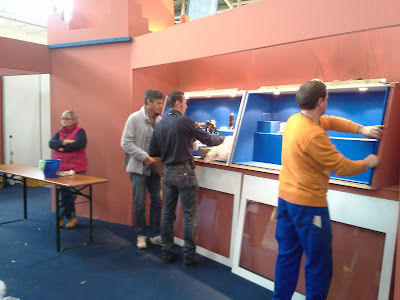 At the end of the day, dealers, collectors and museum staff would gather for a drink at some various booths at the show. 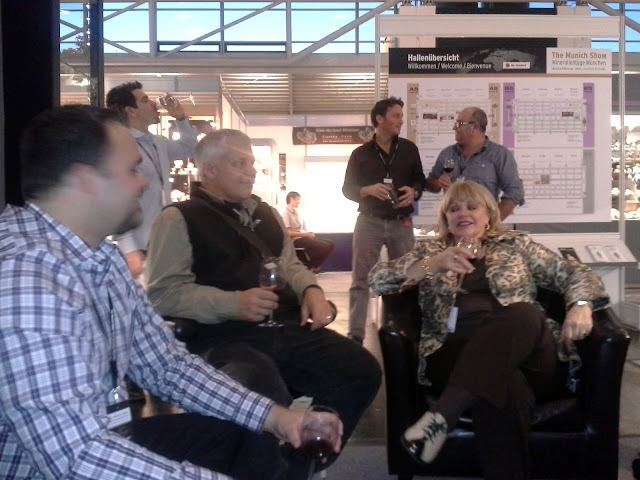 Wine & cheese at Laurent's booth (Polychrom) is always a success! 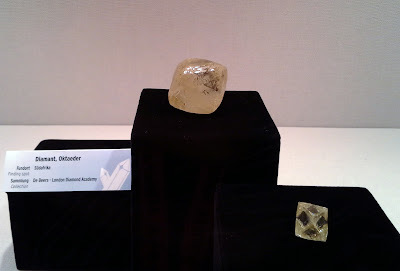 Thanks again Laurent... Also for the lovely gem pezzotaite that you gave to the museum in Tucson earlier this year! Will, John and Jeanne on the foreground, while we can see Dany, Brice and Laurent on the background. Bill telling another good story! Back at the show on the Thursday. It's time to shop around! Or at least do some window shopping. I'm always reluctant to take pictures in people's booth, unless I obtain the authorization from people. So, here come a mix of pictures! 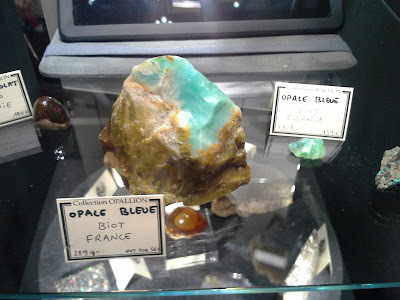 Because I like French stuff!Fluorite from Mont Blanc, France. 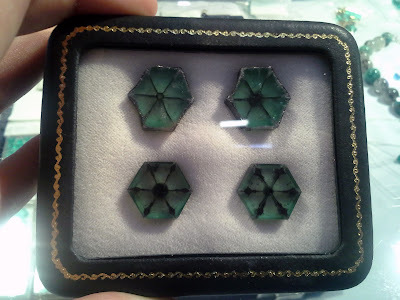 Because we need a trapiche emerald (Columbia). Especially the one on the bottom right! Because there are some opal lovers out there! Thanks Boris! Back in the African secrets. 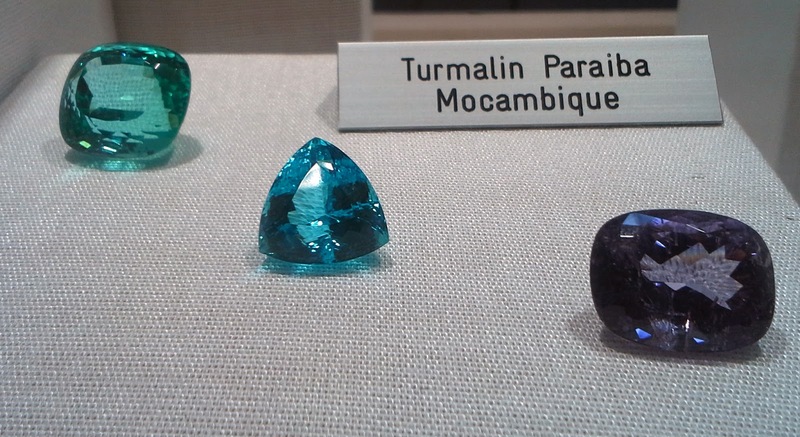 Wonderful gems in incredible sizes! 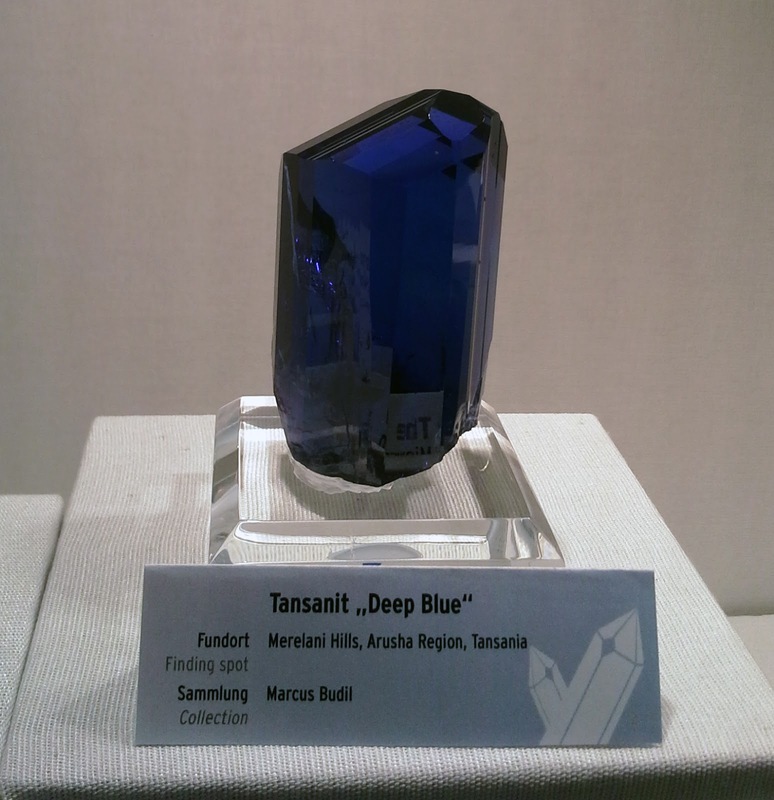 My favorite of the tanzanites. The SMMP meeting: where museum staff meet. Here, Frederico is obviously telling a good story! 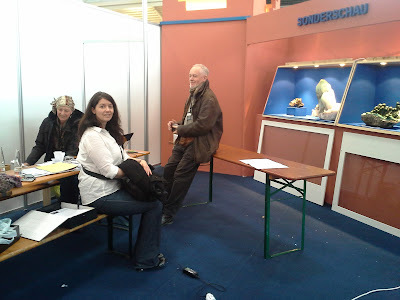 We were only 3 persons representing American museums: Jamie from the American Museum, Alyssa (on the right), and I. Unfortunately, we heard stories of museums closing partially their exhibits, not re-opening entirely their exhibit, suffering of lack of money and interests from their administration in mineralogy... All and all, the museums that still have a bit of money left for acquisitions are the ones having "friends" or "members" of the museum, and/or donors. From all the participants, I would say that the British Museum came through the one having a nice future ahead, with even curatorial positions opening in the near future. 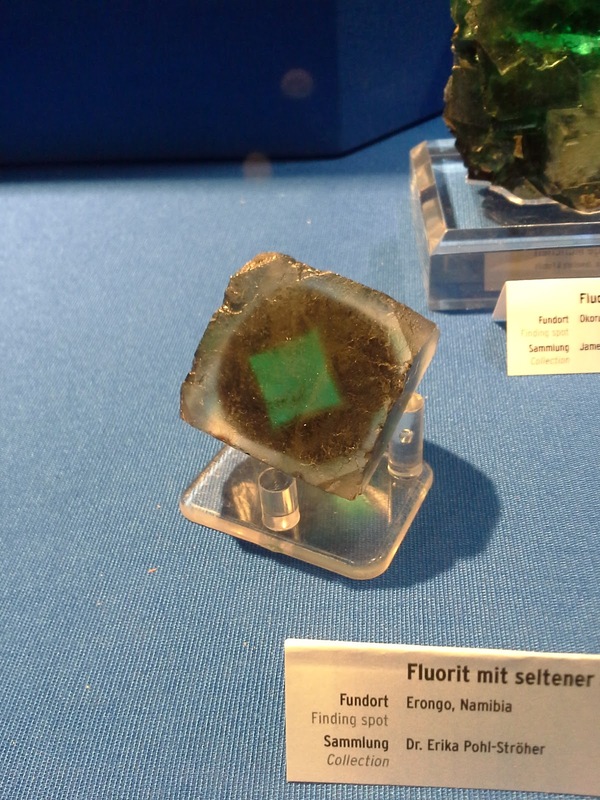 I guess we have to all make efforts to teach people about rocks, minerals, gems, and geology in general to grab people's attention back... And shows like this one in Munich is definitely public-friendly, and help developing interest of young kids (as you will see in pictures below). The other side of the room at the SMMP meeting. What do you say? A lot of dudes? Yes... maybe! 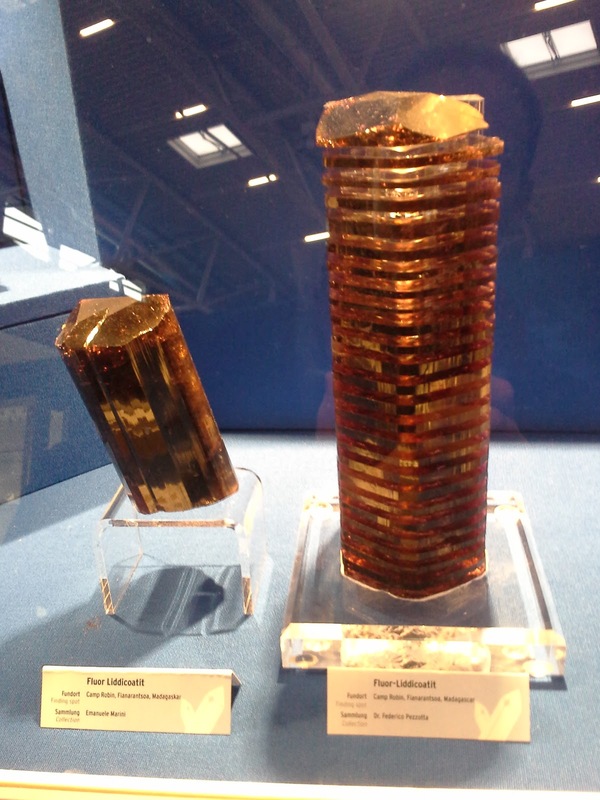 Back at the show, with more African minerals. Liddocoatite from Camp Robin, Fianarantsoa, Madagascar, with a sliced one owned by Frederico Pezzota on the left. The famous DeadMau5 owned by Will Larson. The iconic Snail, owned by Bill Larson. We unfortunately don't have a specimen like this in our collection... 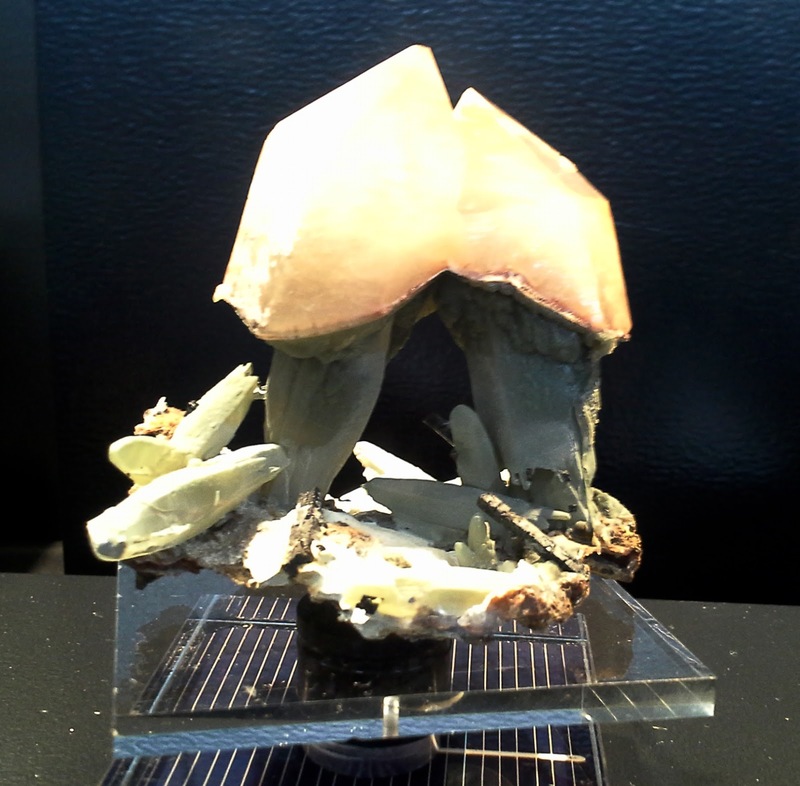 The zoning in this fluorite from Erongo, Namibia is just spectacular! 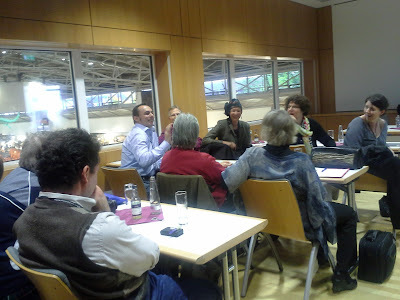 We visited 2 months ago, back in Freiberg, part of Erika Pohl-Ströher collection. She was the one with the most specimens for the African Secret show. I took only a few pictures of her minerals, as most of them were already pictured in our Dresden blogpost. A "beast" of ilmenite from Zambia own by the Sorbonne museum. Jean-Claude... we were jealous of many of your specimens out there! 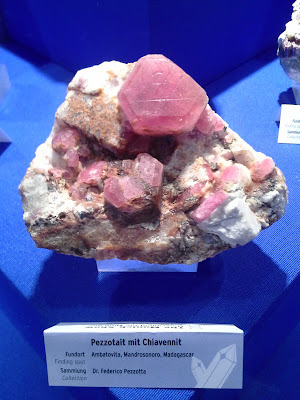 Amazing pezzotaite on matrix (with chiavennite), own by Frederico Pezzota. Just so you can have an idea of the extend of the show. Here is a partial view of Hall A6, where most mineral dealers were. Overview of one of the four Halls. On the right, the African Kasbah contained the "African Secrets" exhibit. Hall A5 (see first picture of this blog post) was dedicated to fossils and minerals. 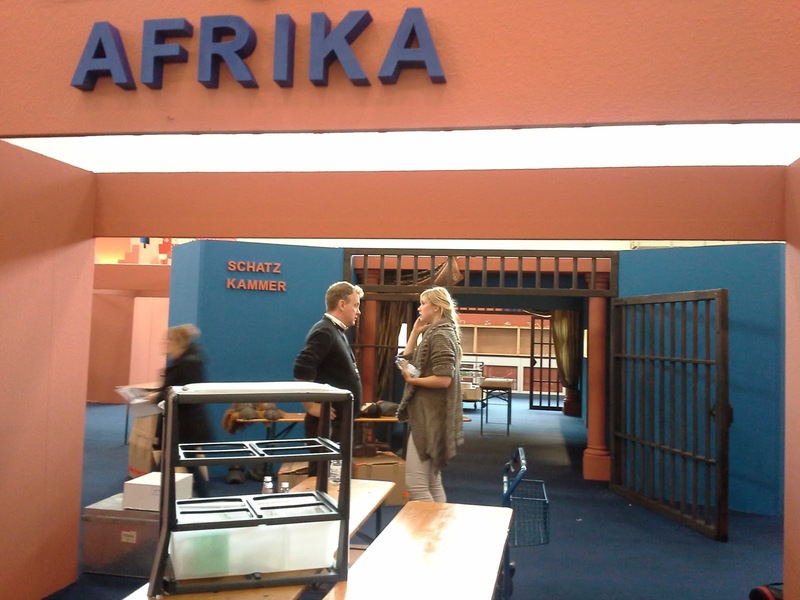 The entrance of the African Secrets exhibit, dedicated to fossils in Hall A5. 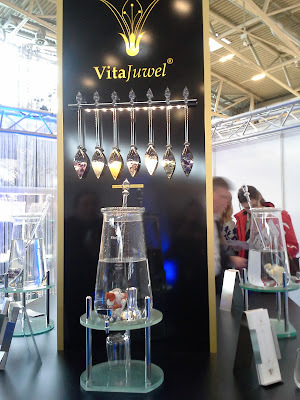 An exhibit about minerals from the Alps in Hall A5, with here, some lovely quartz scepters. 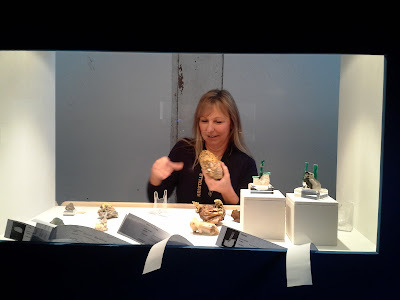 I am realizing now that I don't have a picture of Hall B6, where most of the gem dealers were set up. "Gemworld", as it is called, was created about 3 years ago, and is still trying to find its identity. I would say that only the main aisle of the Hall was really selling gems, while beads mostly are sold in the rest of the Hall. 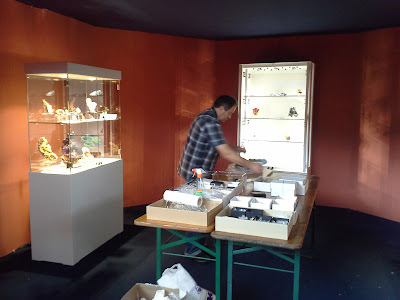 A few jewelry booths, but not as much as I was expecting. Hall B5 was probably the most eclectic one. On one side, there were some really good gem dealers, with a specialty in rare gemstones. 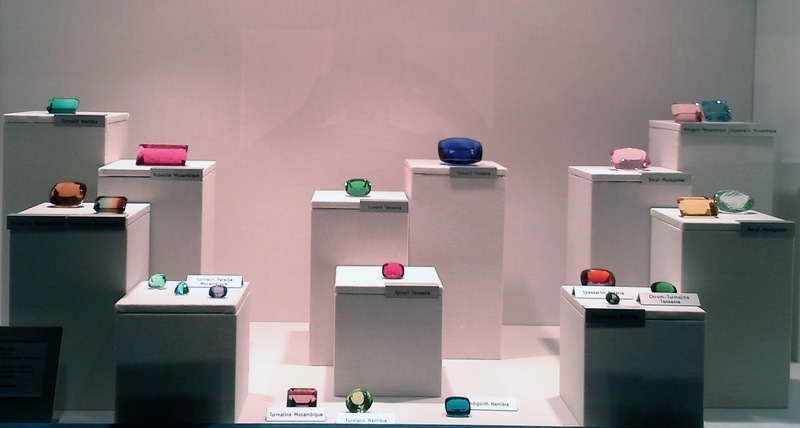 A lot of cheaper jewelry and beads compared to Gemworld. And on the other side, there was the more "mystical" aspect of rocks. Massage tables were even set up so that one could experience the benefit of stone massage and even "sound" massage. But my favorite (in an ironic way, of course) was definitely the energized water (see picture below!). 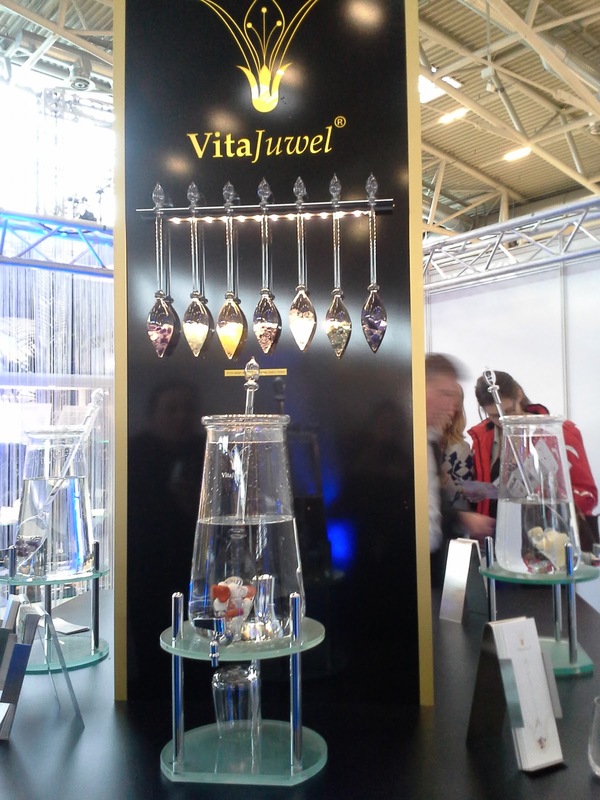 One of the numerous brands selling glass apparatus containing rocks to energize water, for home or restaurant use. I tried 4 different energized waters... didn't do any good to help my short night of sleep (let's blame it on the 9-hour jet-lag!)! 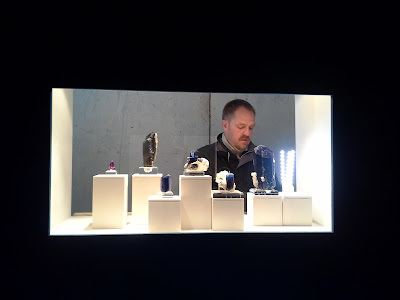 And of course, I have to admit, I took a morning off to go and visit the Shatzkammer (Treasury) of München with Jean-Claude from the Sorbonne museum. 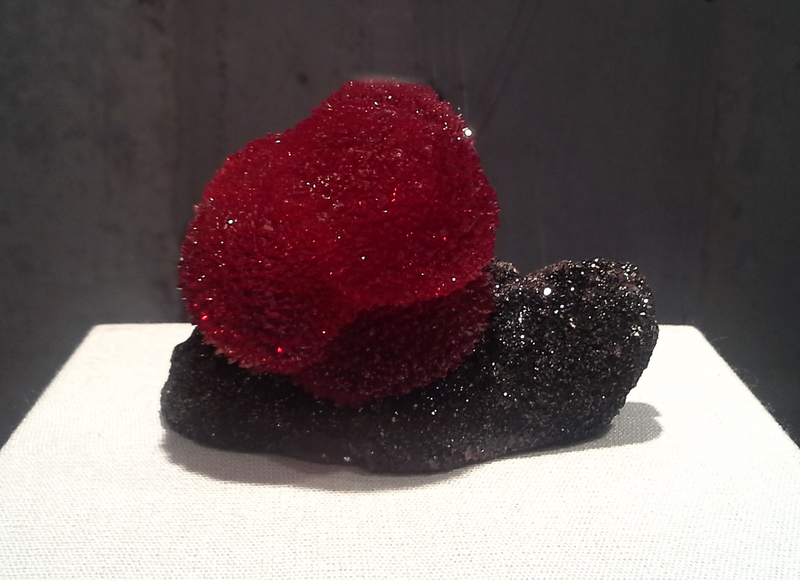 And wow... it was just fantastic to see all of the artwork made in gems, minerals and rocks. Just a few pictures here. But for those who regularly go to the Munich Show, it's definitely worth an hour and half of visit! The Bavarian crown jewels, 1806. Crown from the 11th century! Crown of an English queen; the "Bohemian" or "Palatine" crown with gold, enamel, sapphires, rubies, emeralds, diamonds, pearls; height 18 cm, diam. 18 cm, western Europe, around 1370-80. Cross of Queen Gisela with oak, cast gold, gold plate, gold cloisonné, precious stones, pearls, silk (height 44.5 cm), probably Regensburg, after 1006. Always surprises me: Ostrich egg cup, made with ostrich egg (obviously), silver-gilt, enamel (height 29 cm); probably French or South German, around 1400. One of my favorite! Statuette of St George (gold, enamel, silver-gilt, diamond, rubie/spinel, emerald, opal, agate, chalcedony, rock crystal and other precious stones, pearls (height 50 cm); Munich, 1586-97. 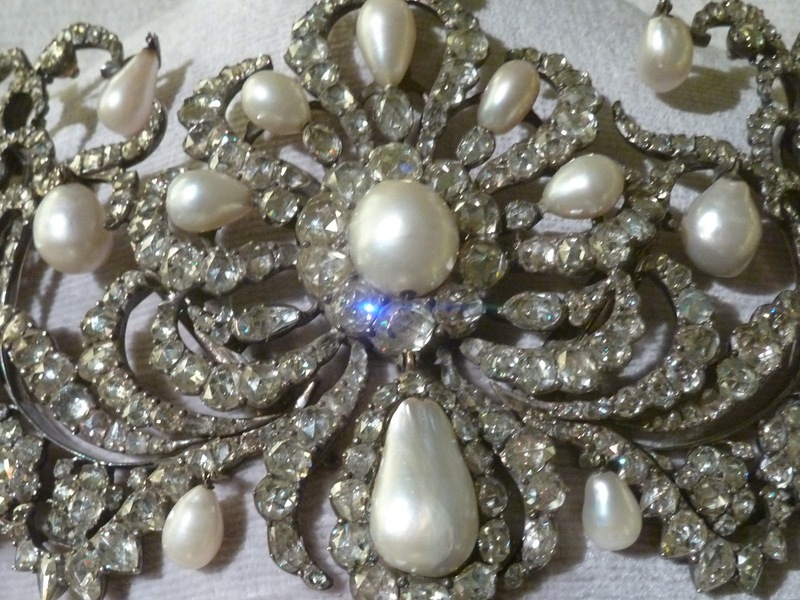 Details of the statuette. Notice the opal eyes of the horse! 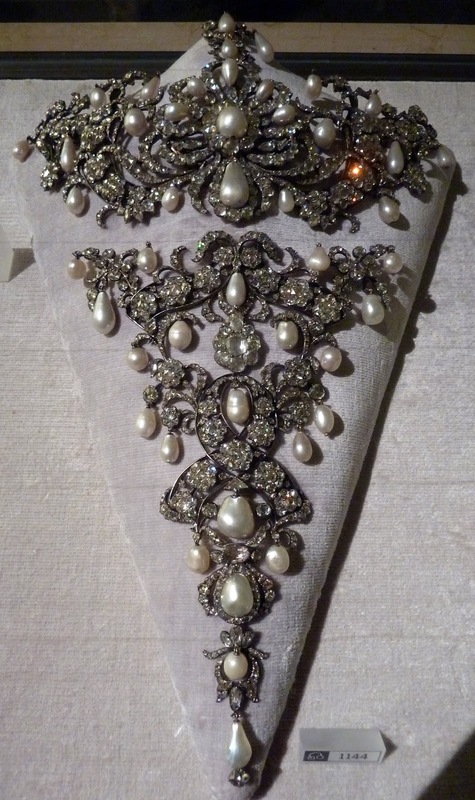 Part of the "parure": Spinel and diamond necklace and earings of Queen Therese of Bayern, around 1830. A wall of Golden Fleeces from the 18th century! And detail of two of them. Best guess is spinel for the big stones, might be ruby for the "smaller" ones. 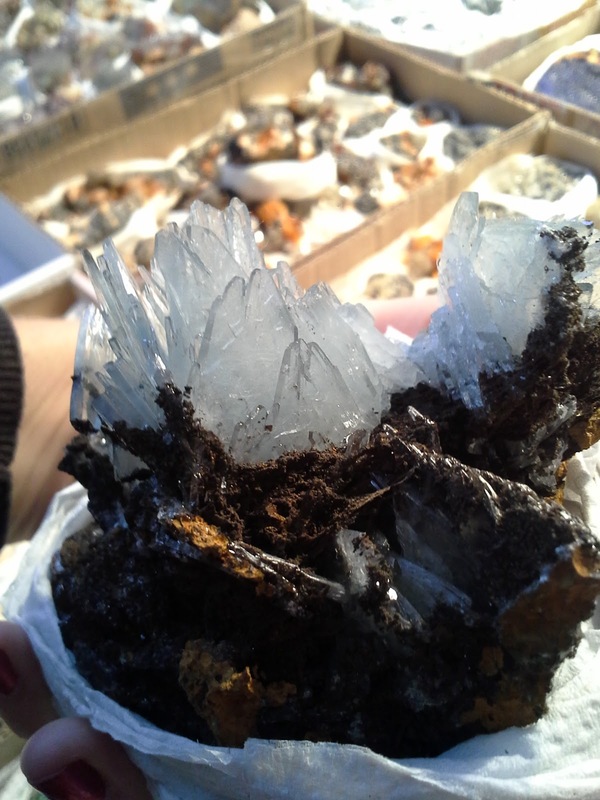 And a few quartz chalices. Amazing agate and gold chalice, with Poseidon on its rim. Diamond and pearls constitute this wonderful parure (1784). Oh... And did I mention that it was snowing in Munich? Coming from LA, the thermal choc was pretty bad! I am not cold, not cold, not cold. Smile for the picture! And back at the show! Not only the public could see some of the best African minerals and fossils on display, but kids could also dig some fossils out, or try to find gold! Not sure that the parents are not having even more fun than the kids! In general, we didn't really see new things since Denver. 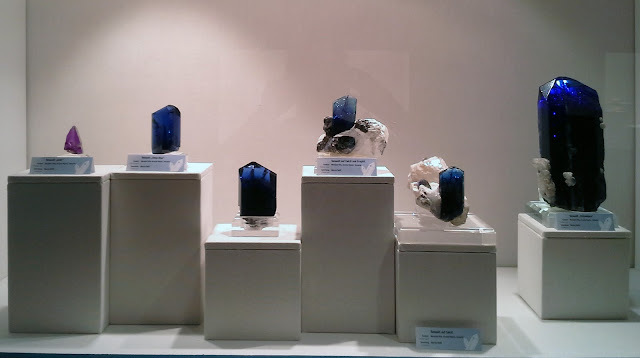 The blue barite from Morocco are still presents (we first saw them in Mibladen, Morocco, during our trip there back in April). As since we first saw them, we are still hesitant to buy as we have not seen a specimen without broken crystals. 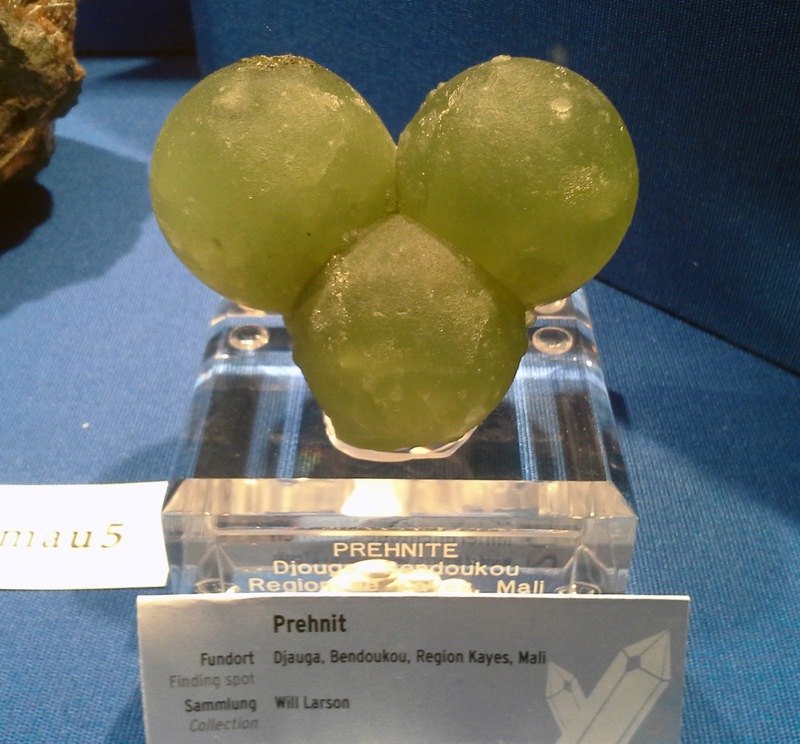 The limonitic matrix in which they are found is soft and extracting them without damage is mostly likely nearly impossible. Maybe we will have better luck in Tucson! On the last day, I rushed around to take pictures of friends. Unfortunately, I missed a lot of you guys, as it was time for everybody to pack things up again, and do the last transactions... But I'll most likely see you again in Tucson in February! Jean-Claude from the Sorbonne museum is found at Marcus Budil's booth. From left to right: Christophe, Jeff, Alain and I. The Kristalle - Crystal Classics team! Alan & Mike from the British Museum, who look to have been successful at shopping! 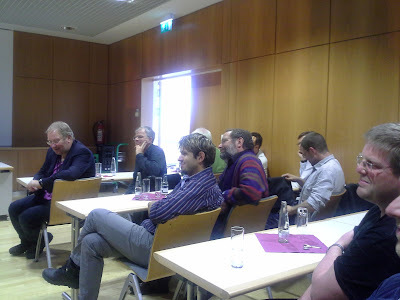 And... a big "THANKS" to the organizer, Christoph Keilmann (center), who did a fantastic job. The show was just stunning! 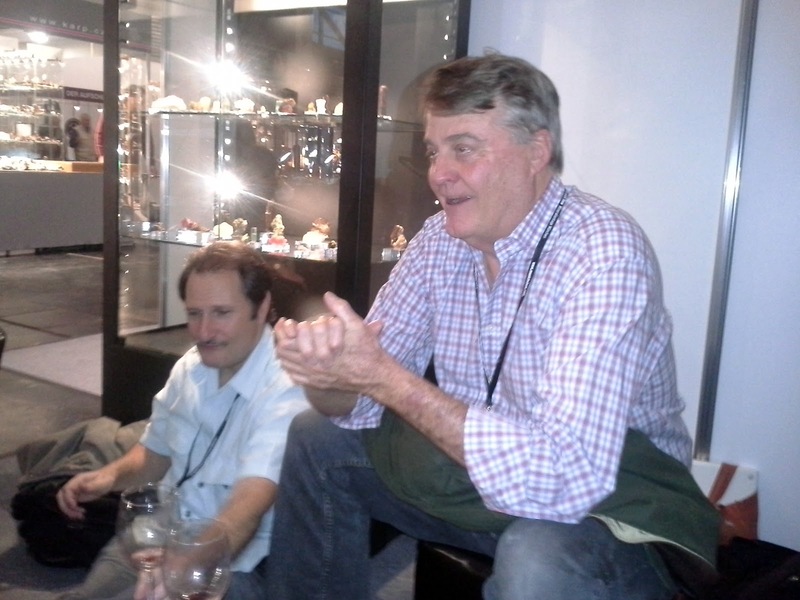 Ian Bruce (left) and his team were also in charge of the mineral exhibit of African secrets, which was a clear success. And Alan to their right, who brought some minerals for the show.